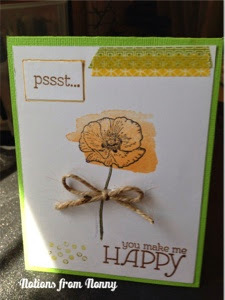 Recently Jill at Luvmy2pugs1 had a half birthday challenge to make homemade cards for Operation Write Home. I am a new card maker, but wanted to do something for our heroes. I really appreciate all that they do for our country and this is just a small thing I can do to show my appreciation. This is the first card I made using my new Inktense Pencils. They are a watercolor pencil that I am just learning to use. To say hello from our state, I found an old coloring page that I used to use for our California State Projects. I am okay with the way it turned out, but realize I have A LOT of practicing to do. To stay with the watercolor theme, the second card I made, I used a new stamp that I just received from my Stampin Up monthly club. It is called Happy Watercolor. 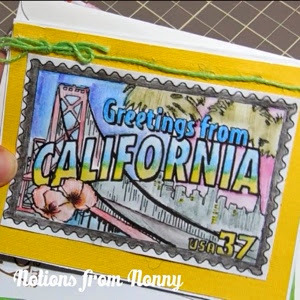 It is fun stamp set that you can use many different colors to make this card very unique. I love how this simple card turned out. Each card I wrote a note of appreciate to the soldier that will receive the card. I truly hope that I brighten someone's day.